Starring: Ewan McGregor, Robert Carlyle, Ewen Bremner, Kevin McKidd, Jonny Lee Miller, Kelly MacDonald, Peter Mullan, James Cosmo, Eileen Nicholas, Shirley Henderson, Pauline Lynch, Stuart McQuarrie, Keith Allen, Kevin Allen, Dale Winton, Irvine Welsh. 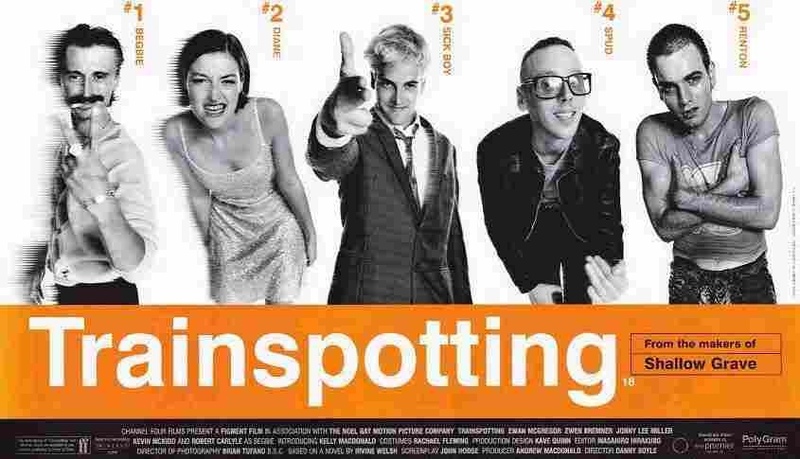 Director Danny Boyle’s marvellous debut “Shallow Grave” was always going to be a hard act to follow but to attempt an adaptation of the ‘unfilmable’ Scottish novel “Trainspotting” by Irvine Welsh, seemed like lunacy. Boyle, however, captures Welsh’s book brilliantly and despite “Slumdog Millionaire” gathering him a best director Oscar, this still remains his best film. It follows the lives of a group of friends from Edinburgh as they experience the high’s and low’s of life through heroin use. Renton (Ewan McGregor) decides to go clean and rid himself of his affliction and his low-life chums but finds that’s easier said than done. 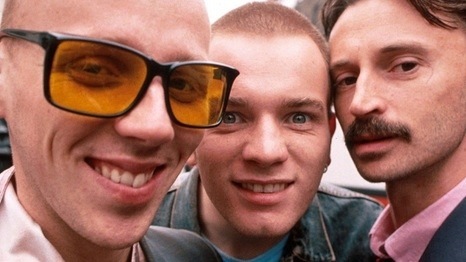 Spud (Ewen Bremner) is too needy, SickBoy (Jonny Lee Miller) is too controling, Tommy (Kevin McKidd) has just taken some bad direction and Begbie (Robert Carlyle) is just plain pychotic. Renton, however, enters into making a one off drug deal with his old pals, so as to make a new life for himself altogether. Boyle’s film has often been criticised as glorifying drug use. Glorifying drug use? Really? People who believe this must have been watching a different film. The characters involved all behave despicably. They are responsible for thefts, fights, deaths – including the death of a baby. Get imprisoned. Contract HIV. Ruin their lives and others’, all because of their drug habit. What this film has in depth, vibrancy and fun, is the reason it could be mistaken for being pro-drug use but having these qualities is more of a testament to the filmmakers involved, in making a bleak and depressing subject matter, very entertaining. The characters are extremely well written (kudos to writer Welsh) and acted by an ensemble of excellent actors. It made a star of Ewan McGregor, who’s character, although likeable – and brilliantly played – is essentially the person responsible for the downfall of many of the other characters. Notable other performances are Ewen Bremner as “Spud”, the most endearing of the group and a character too gentle for his lifestyle. The best of the bunch though, is Robert Carlyle as the psychotic “Begbie”, who’s choice of drug isn’t heroin but violence, and he’s just as destructive with it. He’s a dangerous and highly volatile person and Carlyle perfectly captures the on-edge feeling of his terrifying unpredictability. It’s an award worthy performance that was sadly overlooked. Everything about the film reeks of class. From it’s rollicking soundtrack, to the rich, snappy dialogue, with great characters in hilarious situations and kinetic fast paced direction. This film has everything going for it and stands as one of the finest films of the 1990’s. A relentlessly energetic experience that leaves you craving for more, much like the habit of it’s protaganists. This entry was posted on January 28, 2012 at 6:02 pm and is filed under Crime, Drama with tags 1996. You can follow any responses to this entry through the RSS 2.0 feed. You can leave a response, or trackback from your own site. Very, very good film. One of the best Scottish films ever made. Hey Thomas, thanks! I agree man, it’s a modern classic for me and still Danny Boyle’s best film. It’s also one I include in my top ten. It’s just a fabulous film. Yeah, possibly bias or just that I understand the idiom more. I tend to thoroughly enjoy film’s about Scotland or made in Scotland. We have a bit of a ‘one of kind’ sense of humour which a lot of people don’t get. I thought Trainspotting had it in abundance.